It was a great afternoon a couple weeks ago. The wind out of the southwest was building. The 1-2 foot waves were growing and white caps were beginning to appear. I was on a close reach several miles south of the Long Beach breakwater aiming for the Queen's Gate entrance. The dodger had just proved itself, deflecting the spray from a particularly boisterous wave that managed to get past the remarkably dry, beautifully flared bow of "Narrow Escape", my 1968 Ericson 30. Suddenly water was soaking through the back of my shirt as I leaned against the teak coaming on the windward side of the cockpit. A puddle of water was trapped against the coaming by the 20-degree heeling angle of the boat. And it was working its way through the caulked joint between the two longitudinal planks that formed the port side cockpit coaming. 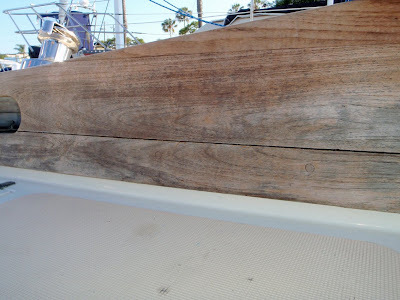 I looked across to the starboard side coaming and saw that it was made of a single plank. No joint to leak. Funny I never noticed that difference before. 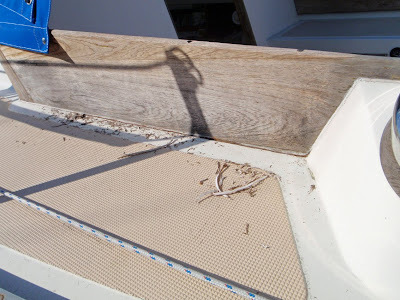 After all, two years ago I had spent months crawling repeatedly over every square inch of this boat refinishing the fiberglass of the cockpit, deck and cabin. But I didn't pay any attention to the teak coaming then. It was coated with old varnish, cracked and peeling here and there, but my attention was focused on a filigree of gelcoat cracks in the fiberglass. Wood refinishing could wait. When I finally did strip all the varnish and decide to leave the teak natural, relying on occasional washes with soapy water and bleach to keep it clean, I didn't pay attention to the differing construction of the two coamings. And I didn't recaulk the port side seam. The other day I tackled the job. First I dug out the caulk between the deck and the coaming outside of the cockpit. 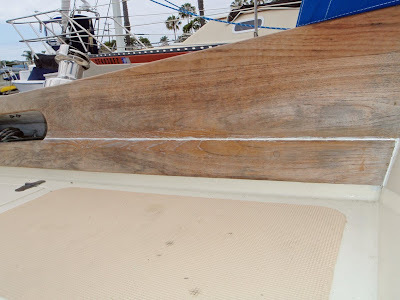 Then I dug out the thinner line of caulk inside the cockpit between the two planks of teak. Somehow it also escaped my notice that there was something inconsistent between the perfectly horizontal line of caulk inside the cockpit and the gently sweeping line of caulk on the outside between the coaming and a deck which doesn't have a straight segment to it. 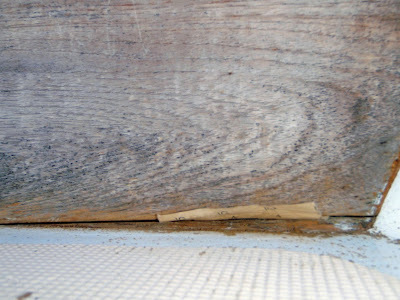 My defective powers of observation got some help when I cleaned out the inside seam with sandpaper and a corner of the paper finally emerged on the outside, slightly above the deck. 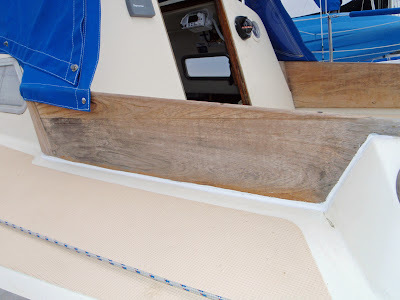 The seam was exposed on the outside for several inches just ahead of the winch pad before it disappeared beneath the upward sweep of the deck. Suddenly my wet back made sense. It wasn't the deck seam that leaked. It was that small, exposed horizontal seam, right where the pool of seawater collected. As for the other question - why was one coaming a single plank and the other was two pieces? 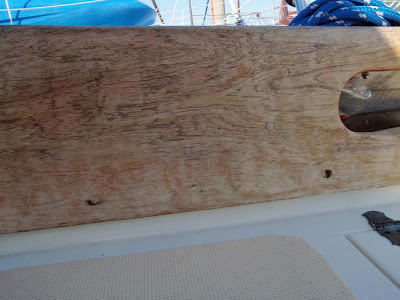 - the only answer I could imagine was that they ran out of wide teak and made do with narrower planks when they built my boat. I searched for some structural reason for the split on the port side and found none. No matter. A couple hours of work and an entire tube of white BoatLIFE Life Caulk should keep my back dry for many years to come.